February 09, 2015 - "Company News"
As manufacturing advances and operations become more complex, Autoquip is leading the charge to design lift systems to meet high performance demands. Lift systems with intelligent controls systems programmed to automate the operation of the lift. And because, we know operations can often change course, you need a lift system that quickly responds. 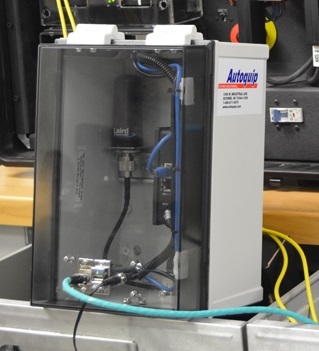 To turnaround quick changes, Autoquip now offers remote programming support which allows our engineers to program, troubleshoot, change, or customize the lift equipment from any location. We offer remote access connectivity through a gateway module that is connected or plugs into a PLC or HMI control which enables our engineers to access the equipment remotely to make changes quickly and efficiently. The gateway module provides a cost effective way to provide the support you need without the expense of a site visit. The remote access gateway device is available by purchase with a new equipment order and is installed within the control panel. A great solution for operations that will need frequent changes. A rental option for existing lifts in service. We will send you the gateway device which allows our engineers to access the equipment remotely to provide a one-time change. Device is sent back to Autoquip after changes have been implemented.